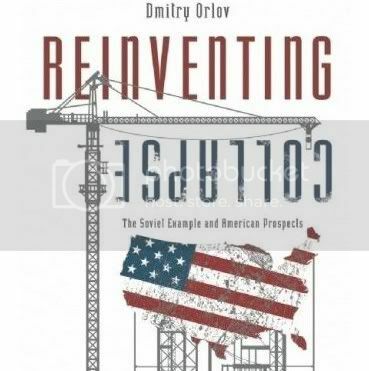 In it, Orlov draws on his experiences of the collapse of the Soviet Union to explore the future American residents like him are likely to face as the effects of the USA’s disastrous economic, energy and foreign policies take hold. Orlov highlights that economic collapse is not, in fact, the unthinkable end of the world, but rather simply a new set of historical circumstances within which to exist. This is a critically important and inherently dark subject, yet the book is suffused with subtle humour, to the extent that at times you are not quite sure when Orlov is serious and when he’s joking. The answer, invariably, is both. This deep humour is an apt way to stimulate further thought in the reader, and after the initial laughter I regularly found myself drawn into a contemplation that led me to Orlov’s insights laying beneath. One subtext particularly intrigued me. 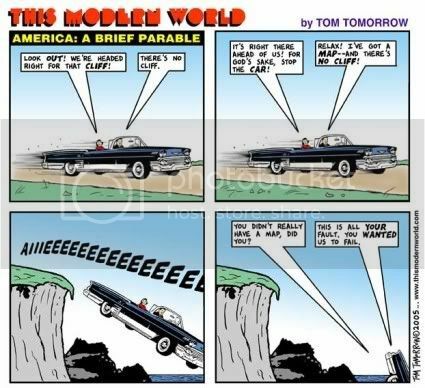 While Orlov argues that the collapse of the US economy is inevitable (I would agree), and will surely be extremely difficult for most of those living through it, various asides implied to me that it could be considered in some respects desirable. This interests me in the context of the desperate urgency of the global climate change situation. As Dr. James Hansen chillingly put it in his recent paper, it is simply becoming a question of whether “humanity wishes to preserve a planet similar to that on which civilization developed and to which life on Earth is adapted”. On his reading of the science (and I trust him) we now have less than seven years to decide. Bearing these stakes in mind, it is interesting to note that Chris Vernon of The Oil Drum quotes the statistic that Russia’s carbon emissions fell 31% in the 5 years from the end of the Soviet Union in 1991. Ignoring for a moment all the other effects of that economic collapse, and considering that the weight of evidence tends to suggest that a ‘great turning’ of the global paradigm may not be likely to take place in time, I am led to ponder whether economic collapse is actually what we should be hoping for – does it represent our best bet for reducing emissions sufficiently quickly to retain a habitable climate on our planet? 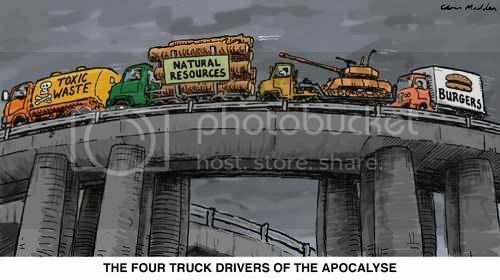 I have written before about my belief that while climate change and peak oil represent the greatest direct threat facing humanity today, they are really only symptoms of a deeper problem. Humanity’s obsession with growth means that if we could wish away the excess CO2 in our atmosphere and generate unlimited oil we would still quickly find our unsustainable way of life pressing up against the next environmental limit, be it food shortages, air pollution, species extinctions or whatever. And in turn this growth obsession is a symptom of the underlying cultural stories and philosophies we use to make sense of our lives and find meaning. Our cultural stories define us and strongly impact our behaviours. An example of a dominant story in our present culture is that of “progress” – the story that we currently live in one of the most advanced civilisations the world has ever known, and that we are advancing further and faster all the time. The definition of ‘advancement’ is vague – though tied in with concepts like scientific and technological progress – but the story is powerfully held. And if we hold to this cultural story then ‘business as usual’ is an attractive prospect – a continuation of this astonishing advancement. Similarly the cultural story that “fundamental change is impossible” makes it seem inevitable. The problem with stories comes when they shape our thinking in ways that do not reflect reality. The evidence might support the view that this ‘advanced’ culture is not making us happy and is rapidly destroying our environment’s ability to support us, it might show that dramatic change is both common and inevitable, but dominant cultural stories are powerful magics, and those who challenge them tend to meet resistance and even ridicule. Nonetheless, my work now focuses on changing these dominant cultural stories – and thus changing our patterns of thought and behaviour – as I see this as the key to equipping our society to deal with the pressing challenges of climate change and peak oil. TEQs, the Transition movement and the various other initiatives listed on my links page (as well as this blog of course!) seem to me to provide the best possibilities for starting to shift our cultural paradigm. Does our need for a relatively benign climate logically dictate that we should be striving to bring about economic collapse sooner rather than later? It is an interesting question, and one that we may need to revisit, but my answer is still no. The human suffering caused by such a sudden collapse is overwhelming, and I believe that kinder options are still open to us. Personally, I believe we still have a chance. I still believe, firstly, that a long-term future for humanity is possible, and secondly that we have a shot at developing a society that responds in a humane way to the crises we face. And I will fight for that possibility for as long as I believe in it and still see a chance that it exists, even as the window of possibility continues to shrink. I will walk through the doors that inspire me. Of course, there is a side of me that asks “but what if we do reach a time when the evidence is clear – when there is no longer any chance of avoiding the devastation of our climate”. If we were on the Titanic and we had already hit the iceberg there would be little point in trying to patch the hole as the waters raged in – so what then? Well, the trite answer would be that there’s quite enough to worry about now without concerning myself with that. The more interesting answer comes back to what we believe life is fundamentally about, but that will have to wait for a future post. Oh, and just what does Dmitry Orlov suggest in terms of personally adapting to an economic collapse? Well, you’ll have to read his book for that! The BNP are one of the few political parties to acknowledge peak oil – they see economic collapse and the turmoil that will ensue, as a platform for their (fill in your own adjective!) policies. We have to raise awareness before that happens. Me again as I’ve just had a thought which is maybe not optimistic enough for this site! The rising cost of oil may be making it harder for US to attack Iran, for example, but we all know that there’s nothing like a good old war to boost the economy. So if rising oil prices trigger a recession and oil price falls again, would that make war more or less likely? I’ve been kinda hoping for a bit of a recession to knock some sense into us. Now I’m not so sure… Maybe this is a rhetorical question but I’d love some optimistic feedback on this! Interesting thought. I might add the refinement that wars are good for the economy *as currently defined*, in just the same way that bombing a city to the ground and rebuilding it just the same would boost GDP. If peak oil does bring down our existing economic paradigm then such absurdities may no longer seem sensible. Burning up our remaining energy supplies in squabbling over the remaining energy supplies may cease to appear like a good idea. Great article. I agree, economic collapse is by far our best chance of avoiding runaway global warming. However, rest assured those with vested interests in the sale and unrestricted consumption of fossil fuels are probably in denial about economic collapse too. They’ll just keep going right to the end. But it raises the question, should we be trying to hasten economic collapse? Or is this deluded thinking? Regarding the rise of the post oil scaries, yes I’m sure they are all studying Orlov too and getting into training for their big moment of glory. This presents an additional hazard which wasn’t really present in post Soviet Russia, though it is now. well, this week saw the north pole finally become an island. there were NO ice bridges to any landmasses, in any direction. This is the first time in human history that such has been the case. Well, increasingly, by applying my understanding of change, i am left with the inevitable conclusion that the point of no return has past long ago. What we are observing, is in fact the beginning of the end. There is no power commanded by the human race, that can reverse the effects we have instigated. Each small change in the ecosystem has knock on effects in a billion tiny ways that we may/may not ever understand, and the situation is now so complex that we have no idea whether any attempts we make will prevent or accelerate the collapse of our planetary ecosystem. As such, we should now focus on understanding medical systems that use no product, and martial systems that require no ammunition. The Simplification is upon us. Prepare to fight over food. Learn to swim and light fires. Brush up on simple carpentry skills and forging, learn a few more languages. Assume electricity and hydrocarbons are soon to be unavailable except that which you can provide independantly. Get used to eating fish. Wonderful piece. I especially liked the graphic. Economic collapse may be a bit of natural selection and, while it seems brutal to expect humanity to find salvation in starvation and economic depravation, it may actually be more merciful than ecological collapse on an accelerating scale.